Private Milan tour with Duomo and La Scala includes: Our private Milan tour includes entrance fees to the sites you will visit and the services of a licensed Rome tour guide. 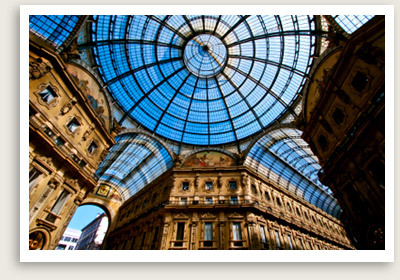 Enjoy a private Milan tour with a private English-speaking tour guide. This private Milan tour features some of the architectural highlights of central Milan. You will start your Milan tour with the Duomo, the city’s magnificent late Gothic cathedral, featuring the tallest Gothic vaults of any church in the world. The Duomo also boasts the world’s most extensive collection of marble statues, most notably the golden Madonna, which you’ll see on your way to the roof for a fantastic view of the cityscape. You will venture down into the cathedral’s depths to view its crypt, known for the series of 13th-century frescoes adorning its walls. You will also see the ruins of a 4th century Christian baptistery here. Next, your private Milan tour will take you to La Scala, perhaps the world’s most famous opera house. The 18th century landmark remains one of the leading opera and ballet theatres in the world. You will visit La Scala’s museum, featuring an extensive collection of antique instruments, including Verdi’s Sommer fortepiano and a virginal painted by Guaracino in 1667, and works of art related to the opera’s history.